Some of the questions I field most frequently involve inquiries about homeschooling and educational resources--the go-tos for the how-tos and what-ifs. Resources can be helpful as we all need boosts of encouragement and fresh ideas for the home education journey. 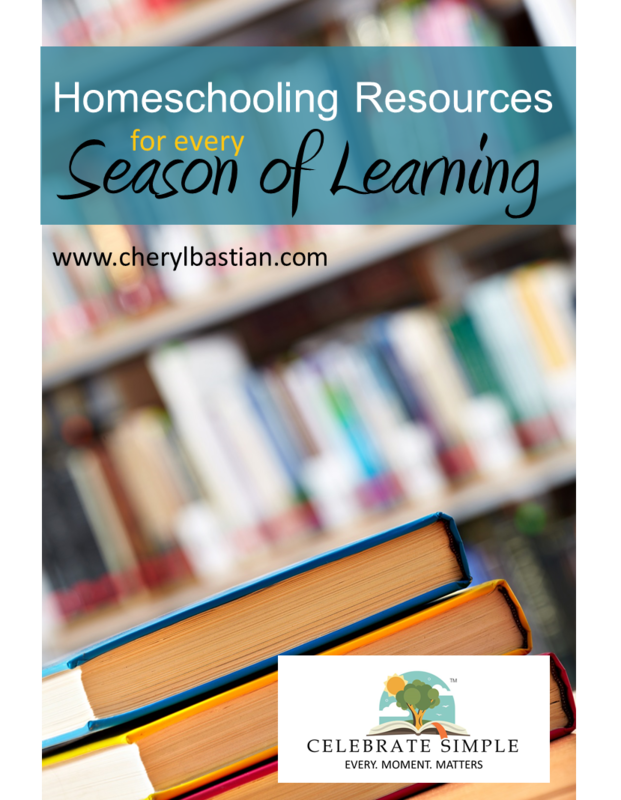 When asked, I recommend the resources I've found most beneficial to us in the shifting seasons of our 25 years of homeschooling. Walking alongside a family, I try to offer recommendations which most closely address that family's unique questions and circumstances. Who has time to read through material which isn't applicable? We don't! We are a community of families with full days and many blessings. To that end, I compiled this blog of resources into categories. As you read through the list, you'll notice many of the selections incorporate multiple ages or facets of home education. Therefore, recommendations which are broad or could incorporate many seasons are listed in each potentially applicable stage. I hope you find this format beneficial. If you have additional questions, ask in the comments or connect with me via email. Do you have a resource you recommend? Share in the comments so others can be encouraged! I had a hard time spelling when I was a child. It was hard. Red marks plagued my weekly tests. Though I understand the reasoning behind word families and traditional methods--I learned the pedagogy as an educator--I've been reminded that theory and practice are not always instant friends. Like any teaching means or method, nothing works for every child. It didn't work for me. It hasn't worked for all my children. Several of my children and I learned to spell by seeing correctly spelled words--and using the correctly spelled words in written context--over and over. repetition in real-life context returned the greatest retention. Perhaps you have a child who learns best by experiencing the written word in real life, in context in the environment.This post is for YOU! Yesterday as I prepared to visit the grocery store, a young learner asked to make my shopping list. I accepted the offer. She made the list and later spelled a few several times in her spelling book. The list provided access and practice to high-frequency (used often), real-life words, words which would be used over and over in her lifetime. The result? Spelling for the day. And, it mattered. Learning wasn't just a list, it was life! Today my daughter asked for more grocery words. I stopped what I was doing and quickly looked for a grocery ad to help us develop a list of words she thought were important. Her perception of what words mattered or would be helpful to her later in life fueled her desire to learn. Ultimately, she realized the words would one day help her make lists for shopping visits and the correct spelling would be important. She had taken ownership of her learning. Grocery words may not interest your child. Instead, words of interest may be might be tied to simple machines, clothing, computers, or art. Start with an interest to discover learning with purpose. If food words are of interest to your learner, here's a leveled list we created. Use a weekly grocery ad to make a list of foods needed for three meals a day, for seven days. Write words on index cards. Choose ten of greatest interest and copy those on a white or chalkboard, twice a day. Younger learners may enjoy writing the words with chalk on the driveway or with a finger in a sand tray. Make a word search. There are word search generators online. Play grocery Scrabble. Only food or grocery words are eligible for play and the weekly grocery ad may be used during play. Take a behind the scenes tour of your local grocery store. Take a factory tour of a milk product processing plant near you. Our local grocery store has a processing plant an hour and a half from our home. It is amazing! Hearing grocery-related words spoken and used in context--builds knowledge of vocabulary and sentence structure as well as provides a means by which math, science, and history content can be gained in a relaxed setting. Hearing content in context often keeps curiosity engaged and wonder active. 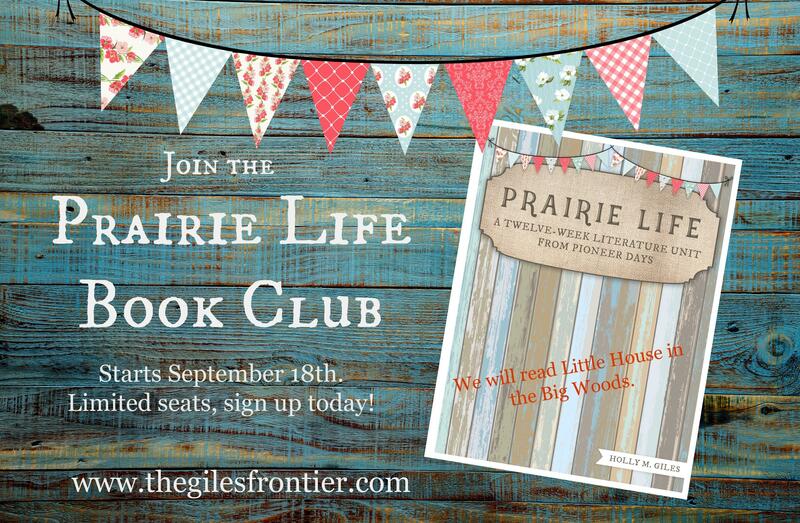 If the interest in everyday food words grows to an interest in farming, check out this post on our favorite farm books! Spelling can be real, relational, and intentional. 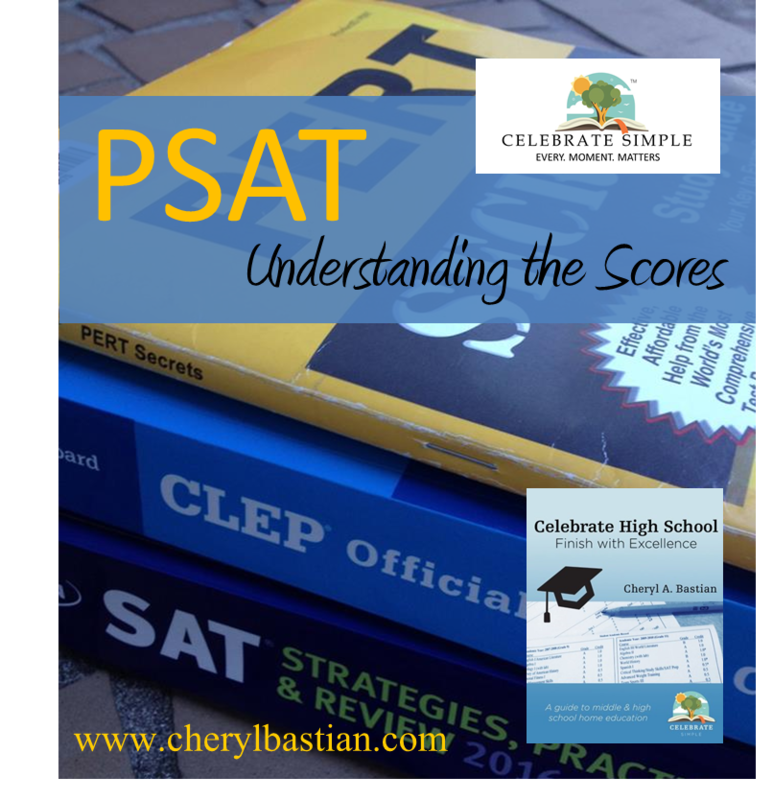 Recently a parent asked me to help her understand the scoring of the PSAT. One of the first questions I asked her was what test her learner took. There are several tests with PSAT in the title (including PSAT8/9 and PSAT10), but only the scores of one test--the PSAT/NMSQT--can be used to qualify for the scholarship. Students usually take the PSAT/NMSQT in the Junior year. There are exceptions to this requirement of which parents should be aware. Though we talked about several aspects of the test and scoring, I encouraged her to connect with several reputable sites so she could better comprehend not only the scoring but also the National Merit Scholarship competition. First, I pointed her to several online resources which explain the scores of each of the PSAT tests: the Duke TIP identification program, the College Board's explanation of the PSAT8/9, the College Board's explanation of the PSAT10, the College Board's parent tutorial for scoring of the PSAT10, and the Princeton Review's scoring guide. Second, I encouraged her to learn more about the NMS competition itself. I pointed her to the National Merit Scholarship Corporation's website where she could read about how to enter the competition. Third, I encouraged her to look over the Student Guide of the National Merit Scholarship Program. This guide is usually sent to school guidance counselors. Because the mom who asked me about scoring was a homeschooling mom, I knew she would be acting as her learner's guidance counselor (of sorts) and thought the guide would be helpful. With these resources at her fingertips, the inquiring mom could find the answers which best paralleled the unique questions she had for her learner. Working with hundreds of parents, one thing I have come to understand is that though there are some general questions most parents ask, parents also ask very specific questions based on the individual circumstances of a learner. Perhaps your questions are both general and student specific. Be empowered! YOU are your learner's best advocate. We--family and friends--sat around tables at my grandmother's 90th birthday. Most were enjoying cake, punch, and conversation. One woman, sitting alone, attracted our attention. My children and I carried our cake plates over and sat alongside her. She was delighted. "Tell us something about your life." "I was an Olympic runner with Wilma Rudolph." I wasn't too sure I believed her--you know, memory care and all. However, after talking, the story became clear and I was convinced. The kids marveled and asked questions--all the important whys, wheres, whens, whats, and hows. After our new friend finished her cake, she insisted we wait at the table while she went to her apartment. She had something to show us. Fifteen minutes later, she walked in the room with a photo album and an Olympic torch! No kidding! She sat back down at the table, opened up the album and pointed to a yellowed newspaper clipping of her standing alongside Wilma. We asked more questions, just like we had in our conversations with Grammy. These women were living history--memoirs--testimonies of real-life, real moments in time. My grandmother celebrated 95 birthdays in her life. In our times together, she shared memories of her childhood, her family, her hobbies, and of times in history she experienced first-hand. She lived through the Great Depression, WWII, the Kennedy Era, the invention of many modern conveniences. She remembers events well, better than most of us on any given day. She holds within her, a living history, of our world and of our family. Several years ago, my then seven-year-old daughter questioned the age of her great-grandmother and made an insightful comment as we studied the Great Depression. Ah, yes child, you understand the importance of passing down stories. Every person has stories and each of us can be story tellers, story bearers, regardless of our age. Stories connect generations; the stories we long to hear, the stories our hearts need to hear. When you have opportunity to visit with someone, particularly someone with age and experience, consider the stories they might share. They will likely be eager to share and you may learn something no one else could share. Did you have brothers and sisters? Were they younger or older than you? Tell me about the house in which you grew up. What activities did you enjoy as a child? What do you remember about your parents or grandparents? Did you go to church? Tell me about the church you attended. Did you have a favorite book? Who read to you? Tell me about your school. Did you play a musical instrument? What was your favorite type of music? What were some of your favorite songs? What did you enjoy doing? Did you have any hobbies? Who were your friends? What did you enjoy doing together? How much did a hamburger and fries cost? Did you have a job? At which age did you start working? Tell me about your first car. How much did your first car cost? If so, how did you meet your spouse? What did you enjoy doing together? Did you have children? How many? What were their names? Did you travel? Where did you visit? Did you serve in the military? Where and when did you serve? What do you remember about your service? What inventions do you remember and how did they impact your life? Have you ever been to a World's Fair? Which one? What was it like? What historical events do you remember? Did you belong to any organizations or clubs? Was there someone who strongly impacted or changed your life? How does what I experienced with that dear Olympic runner, my grandmother, and others impact me and my family? Today, I will purpose to tell at least one personal story to my children, one with which they might better understand their heritage and their world. History can be intentional, real, and relational. In Part I, I shared common concerns homeschooling parents have in regards to high school foreign language requirements. We learned what questions we might need to ask as we walked the foreign language journey. In fact, when our family began researching foreign language possibilities twelve years ago, we knew nothing about what questions to ask or to whom we should ask our questions. Our journey was hands-on and experiential--just like yours--meaning we learned by walking through the experience and making mistakes. In this post, I hope you can learn--not only from our experiences--but the experiences of hundreds of families with whom we have encouraged. These are only samples of the questions YOU may find necessary to ask dependent upon your unique situation. The foreign language journey with our first was fairly uneventful. Four of his five top university choices required two consecutive years of the same foreign language. By making sure he completed two years of the same language we would meet the requirements of every school in which he was interested. It is also helpful to know that our son did not want to dual enroll, so that was not an option. Therefore, we researched every other potential avenue. In the end, he simply completed two years of Spanish with FLVS, an online public school. During his senior year, he applied to six colleges in total, all required two years of the same language. In the end, he chose a local four-year university honors college. At the end of his senior year, the university requested I send the final copy of his parent-generated transcript. Two weeks later, I received a letter in the mail. "Your high school foreign language credits have been verified from a valid source. We have waived the undergraduate foreign language graduation requirements." Fantastic! We didn't see this coming. Of all the homeschooling high school meetings and conference workshops I had attended, no one had ever mentioned there was a potential for a college to use the earned high school foreign language credits to fulfill undergraduate requirements (outside of dual enrollment). We were pleasantly surprised and grateful! Lesson learned: High school foreign language courses may be used to fulfill the undergraduate foreign language requirement IF the courses are taken from an entity approved by the college. Ask: From what entity could a student take foreign language and earn both high school and undergraduate college foreign language credit, aside from dual enrollment? From our lesson with the first grad, our second son charted an intentional plan. Knowing university language courses can be more difficult due to depth of subject and amount of content covered in each class, we brainstormed with our young adult potential language options. He chose to follow the same path as his brother and take two years with the public online school. When he applied to attend a local state college, the admissions department asked for verification (transcript from the online school) that the foreign language was completed. They waived the foreign language requirement for his AA. Yes! Interestingly, once our son earned his AA and continued seamlessly to the four-year university for the completion of his Bachelors degree (the same one from which our first graduated), I received a letter in the mail. "Please submit the final high school transcript so that we may verify completion of high school foreign language." Our second son had his AA and BS foreign language requirements waived because we had taken the foreign language from a source each school considered valid. Side note here for those who wonder if the high school transcript is ever needed after earning an AA. In some cases (like this one), YES! When our third high schooler began to consider foreign languages, knowing what we experienced with the first two graduates, her primary consideration...get it done in high school! She, however, had an interest in American Sign Language. We had to look for an entity where she could learn ASL fluently. Interestingly, as we were deciding next steps, an email came from a friend, a certified interpreter, who was offering ASL 1 the coming year. I knew from research some universities won't recognize ASL as a foreign language. If they did recognize ASL as a language, they may not accept the means by which it would be taught. As a mom, knowing what my daughter might face, I was hesitant to let her pursue this interest. Yet, I knew ASL was a genuine interest and I wanted my daughter to have an opportunity to learn a language that mattered to her. We researched. I connected with one college asking if they would accept ASL as a foreign language. Indeed, the college verified in writing via email that they would accept the ASL. My daughter took the class, realizing that though one college of choice accepted the credit, another may not. They would not, however, used her ASL course to fulfill the university foreign language requirement for her undergraduate degree. But remember, every situation is unique and individual depended upon the career and college choices. For example, last week, a family contacted me with a similar situation. A homeschooled high schooler had actively participated in the deaf ministry at their church where the student interacted and communicated with attendees who were deaf. Other studies were completed. The local state college told the family the student's studies would not likely be accepted for credit. Again, what one college deems acceptable for foreign language, another may not. Ask questions. A student we know sought accommodations for learning challenges. The student was eager to attend college, however knew accommodations would be needed to be successful. The educational psychologist recommended the student, due to the significant learning challenges--dyslexia and dysgraphia--should be allowed to take a substitute course for foreign language. Research and testing--on adult scales which most college require--provided information regarding documented learning challenges and foreign languages. In regards to significant learning disabilities and current, accurate documentation, some colleges may waive or offer substitute courses toward foreign language requirements. This is not true of all schools and is highly variable school to school. Therefore, parents must inquire and must be able to provide psychological reports as needed. Ask: Are college admission foreign language requirements waived--or are substitute courses accepted--for students with documented learning disabilities (on adult scales)? When we began our high school journey we had no idea what foreign language questions to ask. In most cases, we learned along the way, either by personal experience or the experience of families with whom we work closely. And, with two current high schoolers (and several on behind) we are likely to learn even more. Do you have experience with high school foreign languages which my help readers? Please share in the comments.